A great vantage point from the 3rd Annual Arkansas Bucks and Ducks Event. 2018 has ended and what a tremendous year it was for WWIA and our Purple Heart Heroes! We had four outstanding events during the month of December closing out the year on a high note. As we reflect over the successes and impacts we have made this past year in the lives of our Heroes, none of it would have been possible without the incredible support and remarkable efforts from so many of you. We want to sincerely THANK ALL OF YOU for helping us bring honor, connection, and healing to our Warriors. We hope this new year will bring joy and blessings to you and those you love. We look forward to another fantastic year as we proudly serve our nation's combat-wounded Heroes! The WWIA's 11th year of serving our Purple Heart Heroes is officially in the books and I wanted to share a few of the highlights from another exceptional year. WWIA served 205 Purple Heart recipients and 11 Hero spouses on 53 events across North America in 2018. We broke new ground in introducing our culinary arts program and made many new friends across our great nation. As we reflect on the accomplishments of this past year, we know that none of it would be possible without your incredible support and dedication. Our world-class events are second to none, and that is only because of the exceptional work, dedication, and commitment that so many of you put into them behind the scenes and throughout the year. We are humbled and grateful by your willingness to share your time, money, talents, and resources to aid in the healing and restoration of our Heroes. We are truly honored to call you our partners and friends. As we enter 2019, together we will continue changing hearts and improving the quality of life for so many of our Heroes and their families. I want to personally thank all our Heroes, Guides, Associates, Pro-Staff, dedicated supporters, volunteers, and donors for your stellar efforts in serving our Heroes throughout 2018 and I wish all of you much health and happiness this new year. You Still Have Time to Make Your CFC Pledge! ATTENTION! The 2018 Combined Federal Campaign (CFC) giving period has officially been extended until February 8th, 2019 due to the current Federal Government furlough. This means if you haven't made a pledge to help support WWIA and our Purple Heart Heroes, you still have time. The CFC allows federal employees and retirees to make charitable contributions to several eligible charities they personally select by directing a portion of their income or annuitant payments to those non-profits. CFC is the world's largest and most successful annual workplace charity campaign. Your pledges and contributions received help the WWIA continue our work assisting in the healing and restoration of our Heroes. 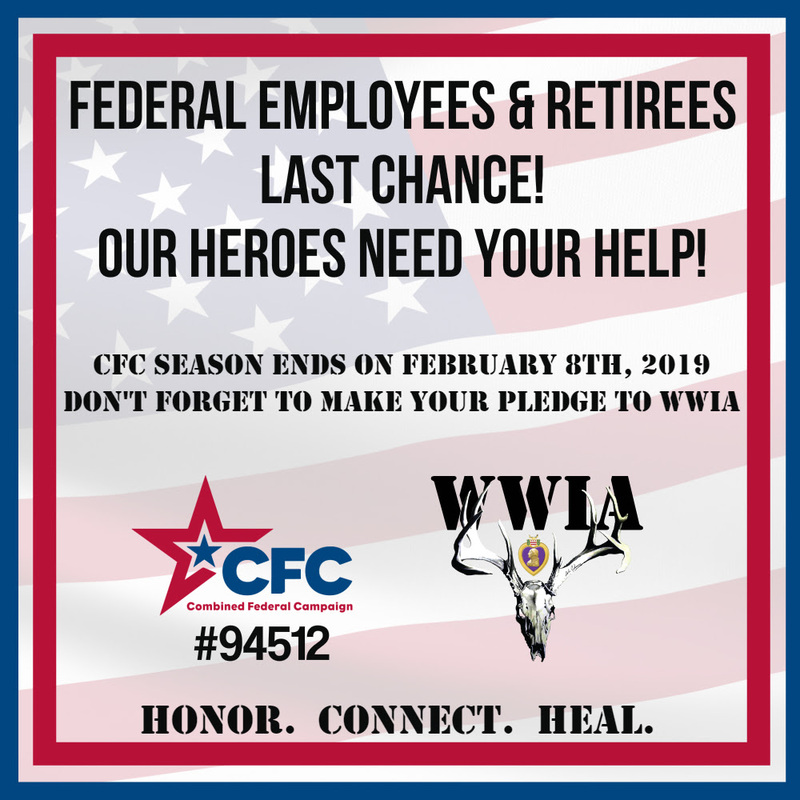 As you look to finalize your CFC charity designations this season, we would appreciate you considering making a pledge to WWIA and making a direct difference in the lives of our Purple Heart Heroes. Click here to be taken to the CFC Donor Pledge Site. We thank you in advance for your consideration and for your faithful support as you partner with us. Three of our Purple Heart Heroes were welcomed to Newfield, NY for the 4th Annual Newfield Deer Hunt. Our Heroes quickly got settled into their cabins at Wilderness B&B, and then enjoyed a nice dinner at the County Line Bar and Grill as they got to know one another. They also received some thoughtful gifts from the local community and event sponsors such as personalized plaques, hunting gear, as well as beautiful hand-crafted hunting knives courtesy of LTC (retired) Gerry Messmer. 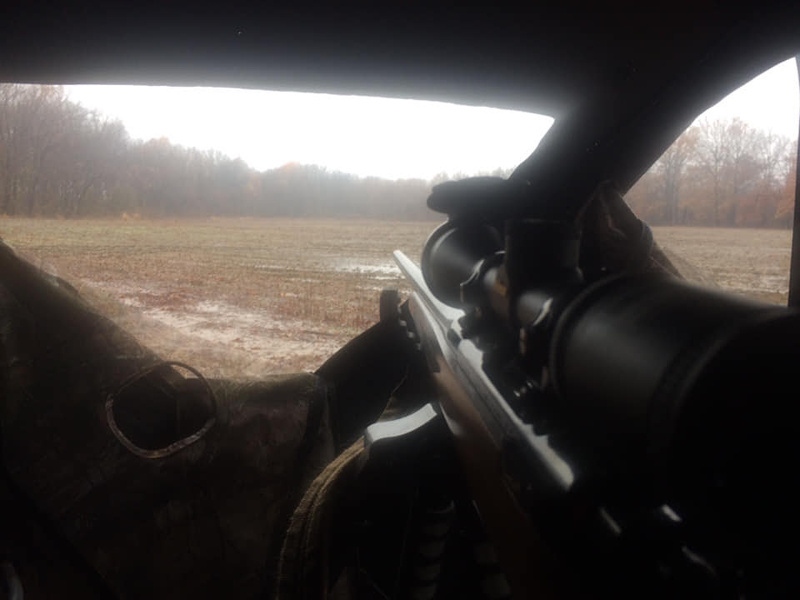 The next morning our Heroes rose early to start their hunt for prized whitetail deer. 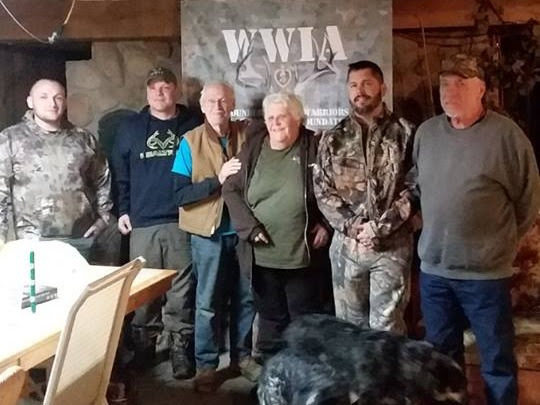 The cold weather and snow made the hunting and opportunities for deer challenging, but there was plenty of time to share stories, make connections, and form new friendships for our Heroes between their time in the field and around the dinner table. We would like to recognize and thank Carol and Bernie Cook and the entire Cook family for graciously hosting our Heroes and for their continued efforts and support. 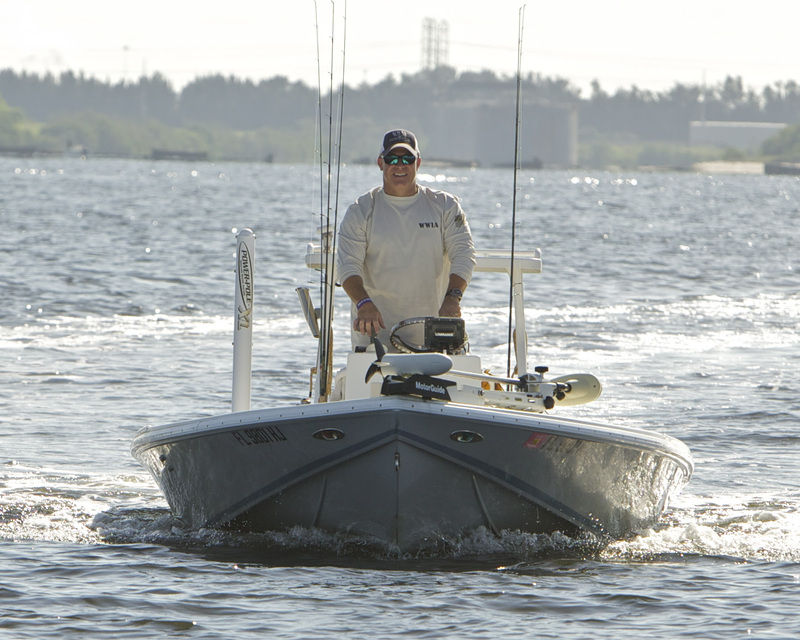 Additional thanks to WWIA Guide Derek Van Buren for his valuable assistance throughout the five-day event. "This was my first WWIA event, it was great. Mr. and Mrs. Cook were wonderful hosts and great people. The deer hunting was good and a lot of fun. I am so thankful for all the work they put in for us. The whole family did all they could. I enjoyed the other three vets and their stories because we were a generation and a war apart. WWIA has done a wonderful job organizing these events. I am looking forward to another on if it is possible." Four of our Heroes traveled to Marianna, AR for the 3rd Annual Arkansas Bucks & Ducks Event. Our Heroes enjoyed six exciting days of deer, duck, and hog hunting as well as plenty of time for shared experiences around the fire pit, amazing home-cooked meals, and bonding between fellow Purple Heart brothers. This area of Arkansas has some outstanding hunting and an abundance of wildlife, and our Heroes found that out first-hand as they harvested some nice bucks, and ducks, as well as a hog during their stay. This event provided our Heroes with a world-class experience they will cherish for many years to come. Special thanks and appreciation to William French and friends for graciously hosting this event and to everyone from the local community that came together to honor, support, and welcome our Heroes. Additional recognition and thanks to WWIA Guide Jeremy Smith for his service and contributions throughout this event. "I don't get out that much anymore. To be able to get out and connect with other veterans was so amazing. WWIA is such an amazing organization and I would like to say thank you. I would also like to say thank you to Mr. French for opening up his home to us." 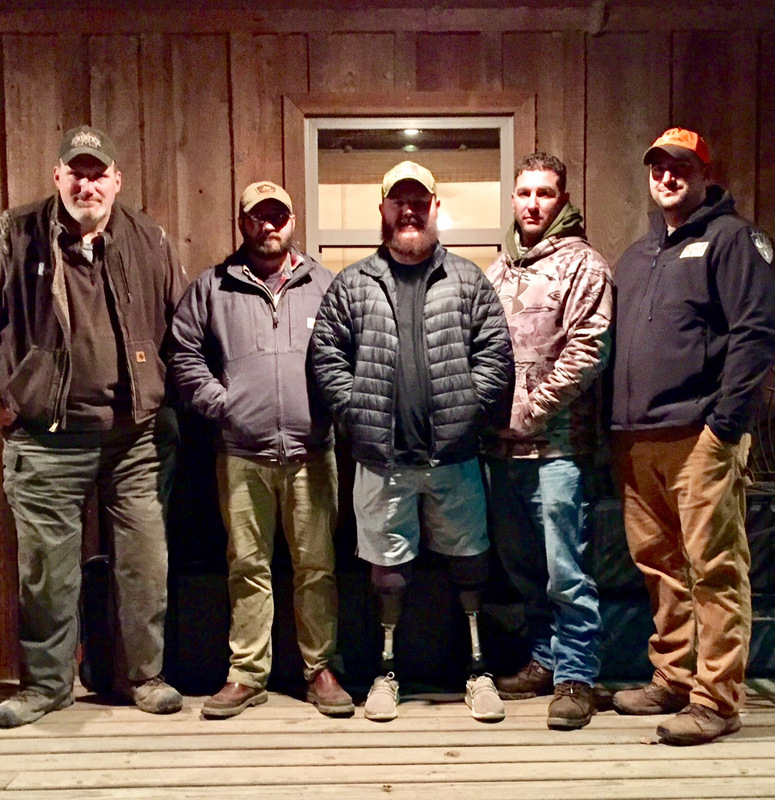 Host, Andy Wilson and the Great Creek Hunt Club were proud to welcome four of our Heroes to Alberta, VA for the 6th Annual Great Creek Deer Hunt. This event was not limited to deer hunting, but also included the opportunity to hunt for bear. This four-day event allowed for exceptional hunting opportunities from stands, blinds, and with dogs. Our Heroes commented that they were amazed at the skill and difficulty involved in hunting with dogs and how intelligent the deer were in the field even with this advantage. 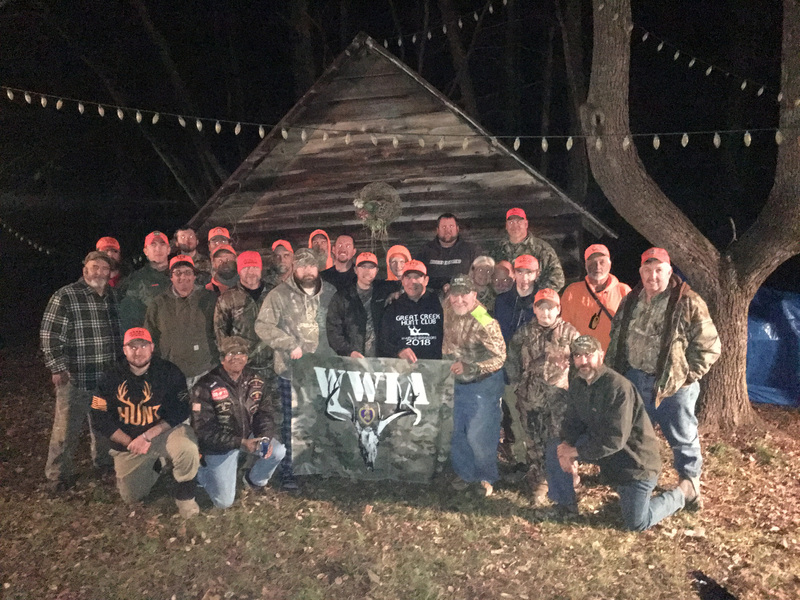 In addition to outstanding hunting, this event had lots of great stories and laughs, incredible food and camaraderie, and new friendships formed between our Warriors and the sportsmen of the Great Creek Hunt Club. We would like to extend our gratitude and appreciation to Andy Wilson and the Great Creek Hunt Club for hosting our Purple Heart Heroes and for their first-class hospitality. Special thanks to WWIA Guide Nick Fox for his leadership and support throughout this event. "From start to finish this has been the most incredible and humbling experience ever. I feel humbled by all the great patriots with their military history, their experiences and their accomplishments giving us so much and even more so, their time. From the invite to attend this event to the initial OPORD to the flight touchdown, I have yet to see such a detailed deployment on such an operation outside of the military. Nick and the Great Creek Team were invested, truly wholeheartedly invested in our comfort, success, and receipt of gratitude on behalf of WWIA. This retreat, this golden opportunity in such a beautiful place with such beautifully hearted patriots further concretes our pride in what we do. It motivates us! We eat, sleep and breathe what we do because of patriots such as WWIA and the Great Creek Team. Thank you for all you do. I am already more resilient after one day in this environment. Thank you for taking care of us and our Purple Heart Recipients. You have fostered a desire to take care of our own with so much pride. Keep on making a difference and thank you for all that you do." 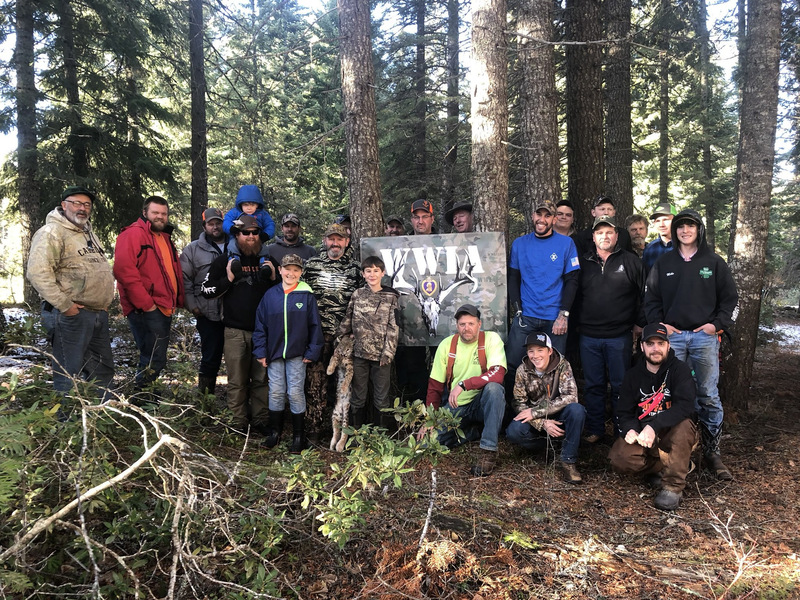 The 3rd Annual Oregon Bobcat Hunt proudly welcomed our Purple Heart Heroes to hunt for this elusive and challenging game. This event brought three of our Heroes together over five days allowing for great stories, food, camaraderie, and some much-needed time in the great outdoors. Although the weather conditions were cold and challenging at times, two of our Heroes successfully harvested bobcats. Our Heroes were also the guests of honor at a wonderful banquet courtesy of the Fern Ridge Tree Hound Club. This dinner allowed local community and Hound Club members to honor and thank our Heroes for their service and sacrifice to our country. Several of the Hound Club members were also recognized for their outstanding support of the event and were presented with WWIA challenge coins by WWIA Guide Joe Liddell to commemorate their contributions. Our sincere appreciation to the Fern Ridge Tree Hound Club for proudly hosting our Heroes and for their hospitality throughout this event. Additional thanks to WWIA Guide Joe Liddell for his tremendous support and coordination. "Thank you so much WWIA and Fern Ridge Tree Hound Club! This was my first hunting trip and honestly didn't know what to expect hunting with tree hounds. It was truly amazing! Everyone was so welcoming and eager to share their knowledge. It was great getting to know everyone and getting to interact with the hounds. I was fortunate enough to get a bobcat on this hunt, thanks to everyone's hard work and dedication. Even if we didn't get a cat it would have been a great time riding around the woods with the dogs. I learned so much and I'm so thankful for this experience! This is something I'll never forget! " Barbara Gibson (left) presents WWIA DoubleCreeek Lodge, TN Host Shelley Cohen (right) with a generous donation on behalf of Middle TN ENA. 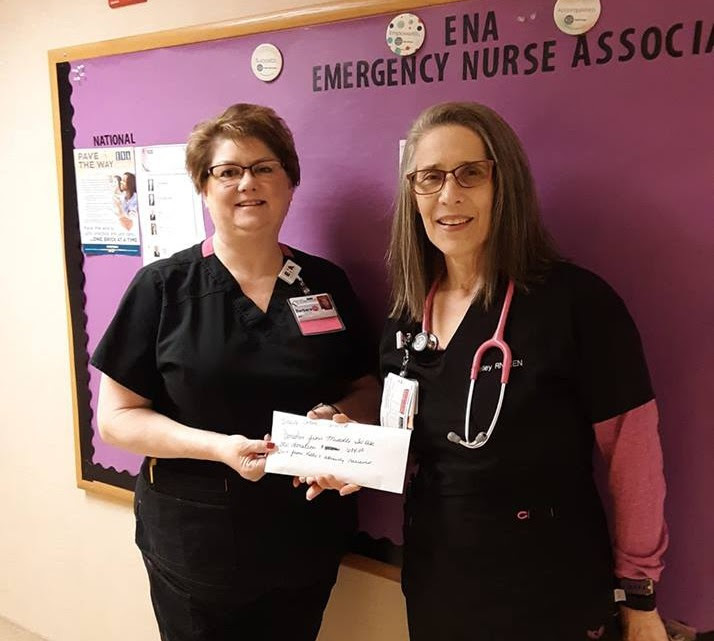 Middle TN Emergency Nurse Association generously selected WWIA as their holiday charity and raised more than $600 in cash, Kroger cards, and gas cards to be used for upcoming WWIA events in Tennessee. WWIA and all our Purple Heart Heroes sincerely thank you for your thoughtfulness and support! 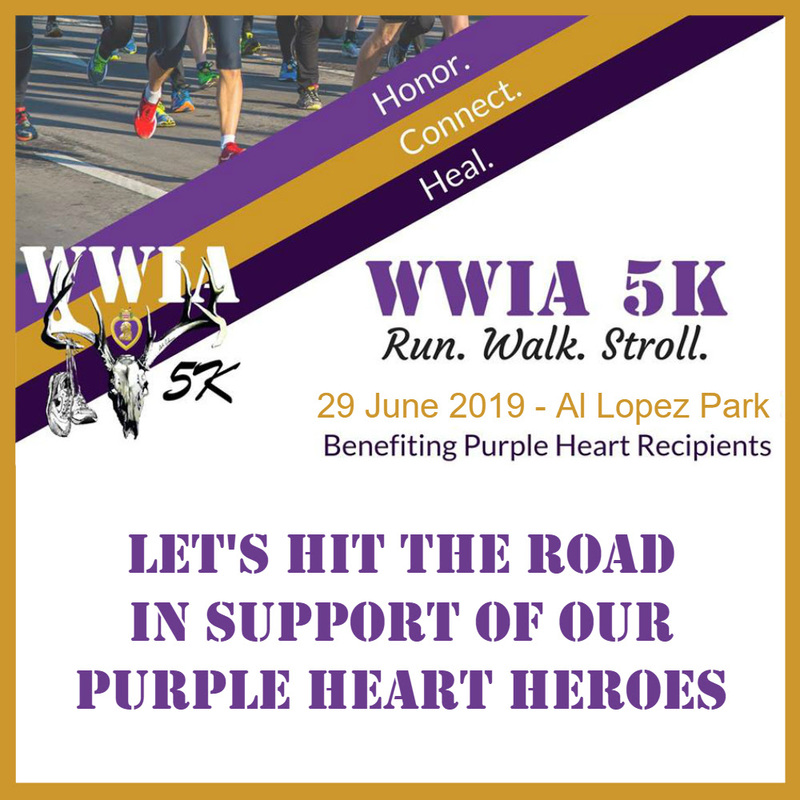 The Inaugural WWIA 5K is Coming! The WWIA 5K has been rescheduled! That means you still have time to get yourself, your friends, your family, and your co-workers registered. Join us on Saturday, June 29, 2019. This timed 5K offers you the choice to run, walk, or stroll through beautiful Al Lopez Park. Our race is professionally timed, and the Overall Top Male and Female finishers will receive prizes. Top Male and Top Female finishers in each age category will also be acknowledged. Stay for our after-party for ice cream, awards, and more! Discounted registration is available for Veterans who show their Military ID or Driver's License with a "V" symbol at packet pickup with Promo Code VET20. Purple Heart recipients will be able to participate free with registration to WWIA by using Promo Code PHFREE. Visit https://wwiaf.org/heroapplication/ and complete all three steps at the top of the page. Proceeds benefit the WWIA. We also have limited sponsorship opportunities available. Please email us at: info@wwiaf.org for more information. Thank you. 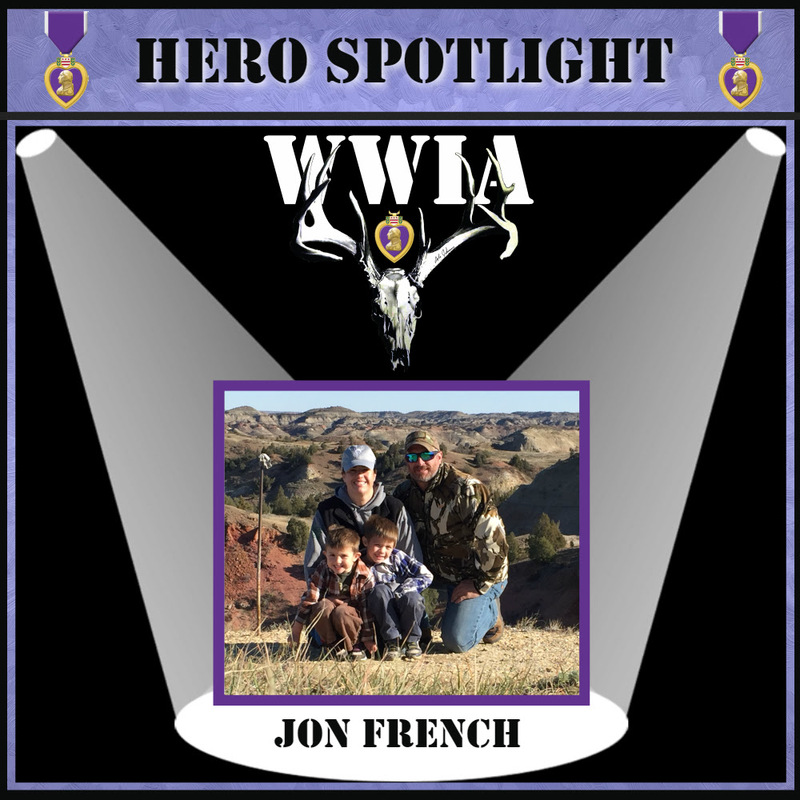 It is with great pleasure that we introduce you to our December Spotlight Feature, WWIA Hero, and Guide, Jon "Frenchy" French. Jon was gracious enough to give us some insight into his life and his experiences with WWIA. Jon, can you give us a brief introduction and tell us a little about yourself and your family? A farm-boy since six-years-old, I grew up hunting and fishing with my mom, dad, and siblings. Their love and support enabled me to play ice hockey, go to college where I would play collegiate hockey and then enlist in the US Army. Hunting and fishing have always been a staple in my life. It was something we did as a family. In eastern Afghanistan on July 19, 2009, I was struck in the front chest plate with a rocket-propelled grenade (RPG). This near death and life-altering experience left me somewhat lost as far as what interest in life I still had. Through friends, family, the WWIA, the hunting and fishing community and my beautiful wife Margaret, I began to reconnect and strengthen who I was. I figured out who I wanted to be again and developed goals to strive for. Today, Margaret and I raise our two young sons, Andrew and Mike, with the same passion for the outdoors and fishing/hunting heritage that we were blessed with. The Foundation fostered and enforced the notion that although I can no longer take care of my fellow soldiers next to me on the battlefield or in training, I can help watch out for them when they need help. The ability to serve them and others, my love for my country and raising my family is my driving force. How did you first get involved with WWIA? I was introduced to the WWIA Foundation through a fellow soldier (WWIA Guide Derek VanBuren). He and I were both deployed and injured together. He found the Foundation online at Walter Reed Army Medical Center and signed up. After he went on an event, he insisted that I try it. He even went as far as signing me up. I owe it all to Derek VanBuren. Why do you choose to be a WWIA Guide on our events? I enjoy helping others experience life-changing hunting and fishing events. Nearly all WWIA events present the Warrior with an experience that most, including myself, wouldn't have been able to experience had it not been for the Foundation. Being able to help facilitate these extraordinary experiences, help them regain a passion in their lives and provide something they can build off and motivate them again; that is why I choose to be a WWIA Guide. What has been the biggest benefit for you since becoming involved with WWIA? I believe the biggest benefit is the ability to connect with other Wounded Warriors. You share stories, have that common bond with them and learn from them as much as they learn from you. Wounded Warriors are typically a humble community that usually won't ask for help. When Warriors get together to share a hunting or fishing camp, they share experiences, advice and open up. It's incredible, how despite the conflict, terrain or era, the Warriors regain that camaraderie and create that connection with one another. What is something you would like others to know about WWIA and your own experience with the Foundation? WWIA truly changes the lives of the Warriors, Hosts, Guides, and volunteers that are involved with the Foundation. For the Warriors and Guides, it fills the much-needed void of camaraderie as well as providing a passion and direction. It provides that support and confirmation of others being there, mutual understanding and belonging. For the Hosts and volunteers, it creates a connection with our Nation's heroes that few outside the military will ever experience or appreciate. For Guides and Associates, it provides an additional purpose, knowledge and solidifies the healing powers of the outdoors. What would you say to others who are considering getting involved with WWIA as a Hero or in another capacity? For other Wounded Warriors thinking about signing up and going on an event, it's life changing. The bonds you make will provide support and friendship for a lifetime. The hardest part is taking the first step outside of your house/comfort zone. Once you take that first step, you'll quickly find or rekindle that passion which will carry over into your personal and professional lives. Connecting with the outdoors helps reset your soul to live a happier life. For the Hosts and volunteers, words cannot express the impact that your kindness and generosity have on our nation's Heroes. You are changing lives by just sharing yours with them. Thank you, we can't say it enough. We would like to express our sincere appreciation and gratitude to the following supporters for their gracious contributions and dedication to WWIA and our Heroes. THANK YOU! Thank You, Highland Corporation Charitable Fund! WWIA DoubleCreek Lodge, TN Host Dennis Reynolds (middle) accepting a generous donation from Highland Corporation Charitable Fund. 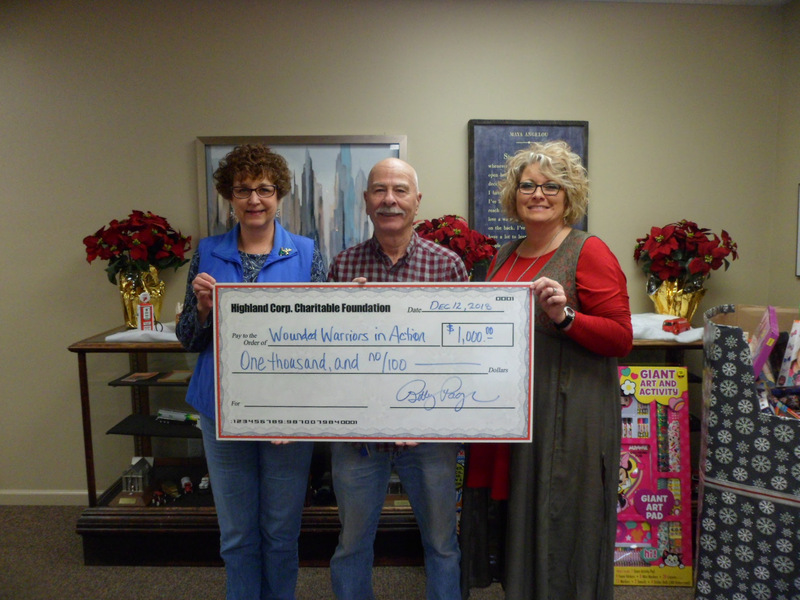 Thank you to the Highland Corporation of Hohenwald, TN for your generous donation again this year of $1,000! 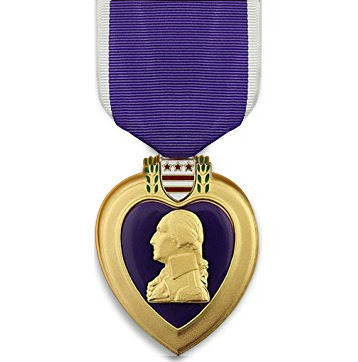 These funds go directly to the travel costs of the Purple Heart Heroes that come to TN to participate in WWIA hunting events. Community support is essential to serving and honoring our Heroes and we genuinely appreciate your generosity. 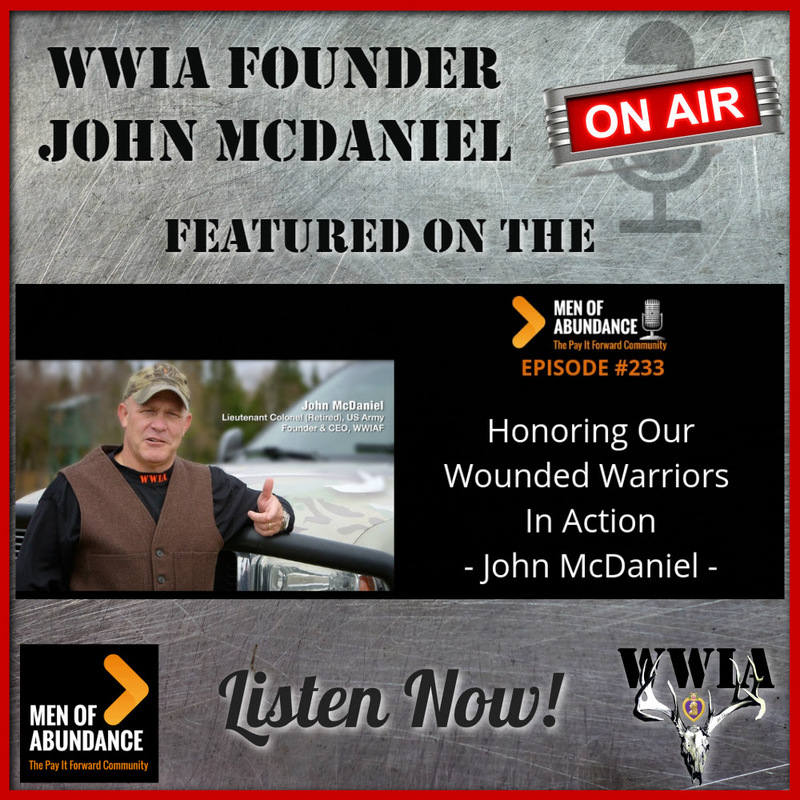 WWIA Founder and CEO John McDaniel Featured Guest on MOA Podcast! WWIA Founder and CEO John McDaniel was honored to have recently been a guest on the Men of Abundance Podcast with Wally Carmichael. Be sure to listen to this outstanding conversation between John and Wally as they discuss the foundation and mission of WWIA, selflessly serving others, overcoming adversity, and creating a life of abundance through daily actions and intentionality. Make sure you share this podcast with others! Thank You Rapid River Knifeworks! 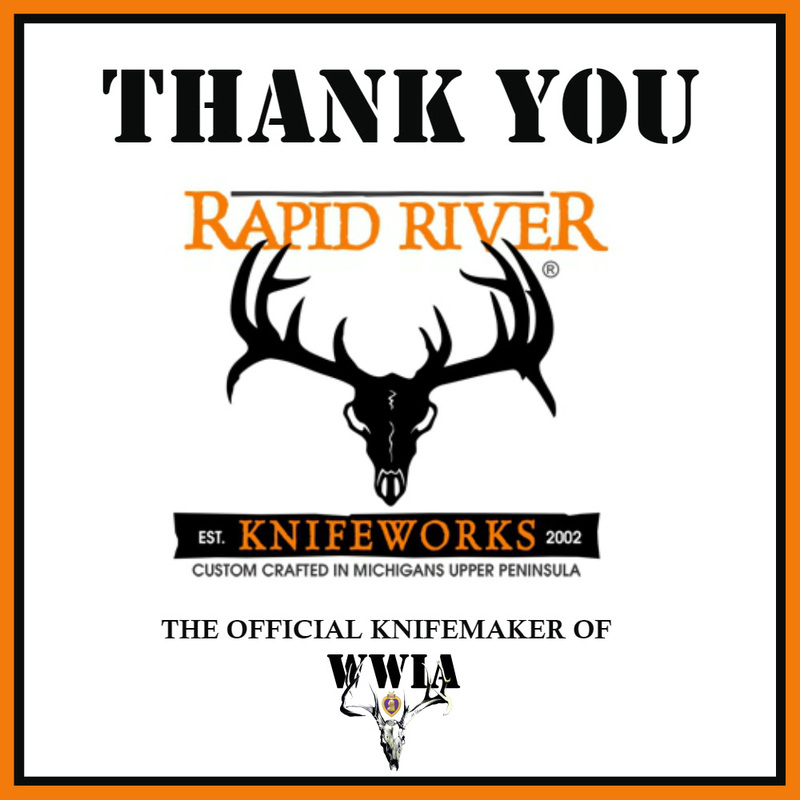 WWIA would like to recognize and thank Rapid River Knifeworks, the official knifemaker of WWIA for their outstanding and faithful support. WWIA Founder and CEO John McDaniel discovered Rapid River Knifeworks while traveling through Northern Michigan during the early years of the Foundation. He stopped in, bought a few knives and was immediately impressed with the quality, craftsmanship, and uniqueness of their products. Mutual respect and friendship were soon born and Rapid River has been graciously supplying WWIA with beautiful and functional knives for our Heroes and friends ever since. If you're looking for a top quality knife to get the job done in the field or on the water or to give as a special gift, check out Rapid River's impressive collection of custom-made products here. Our sincere thanks to Rapid River Knifeworks Founder and CEO Kris Duerson, to General Manager Matthew Seawright, and to all of their talented and patriotic staff for their support and generosity throughout the years. Help Support WWIA Through Vehicle Donation! 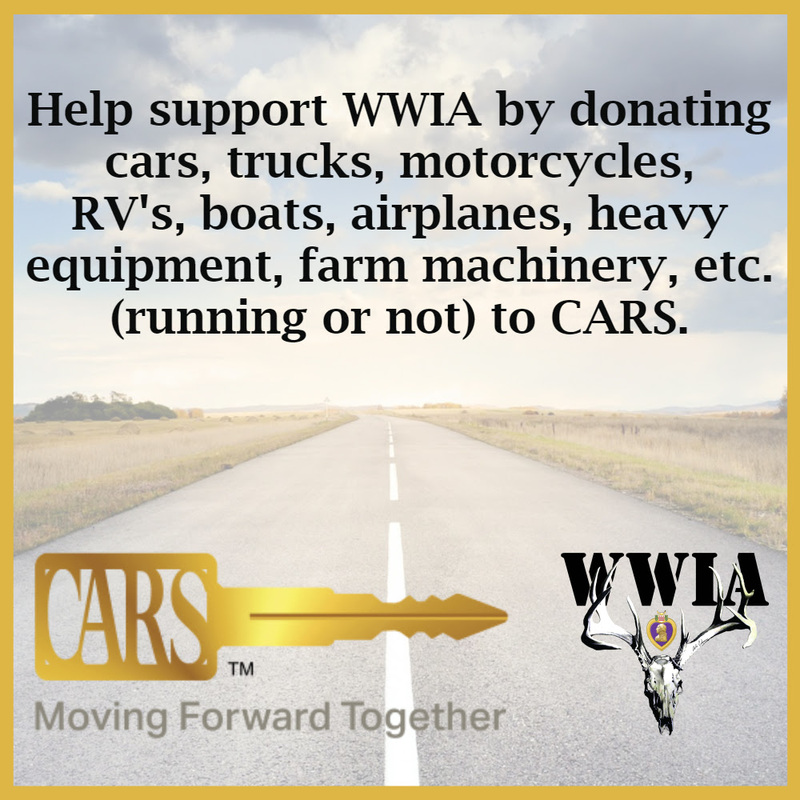 You can help support WWIA and our Heroes by donating your car, truck, van, SUV, boat, motorcycle, ATV, RV, trailer or airplane. V-Dac recently joined the CARS team to help continue providing opportunities to support non-profits through vehicle donations. You will still work with the same outstanding representatives that you have come to trust with your donation needs. Simply click here to start the donation process or call CARS toll-free at 855-500-RIDE (855-500-7433) to have a donation staff specialist help guide you through the donation process. If you would like to learn more about how the CARS vehicle donation program works, please click here. We thank you in advance for your support!